Even though I'm feeling ok - just a little sensitive on the left side of my face - it was recommended that I stick with 'light' duties today. So I am. I got a rather long email crafted earlier - needed a lot of thought before I finally hit 'send' but neither did I want to forget to do it while things were still fresh in my mind. Plus I contacted another potential teacher for our conference. I kept forgetting - too many things on my mind. 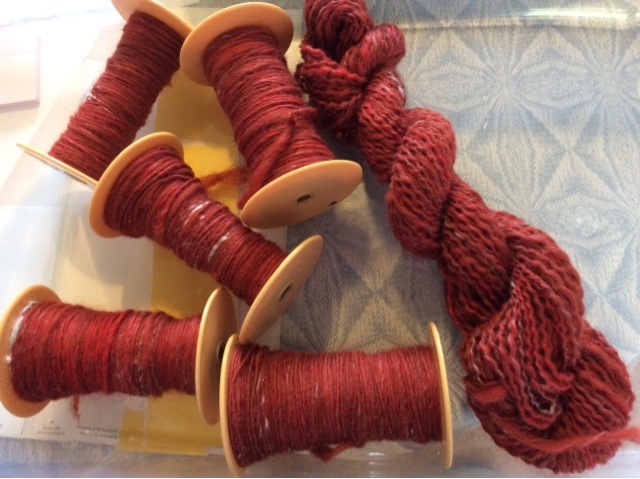 In between I started plying this brick red (mostly) singles I spun up last week. 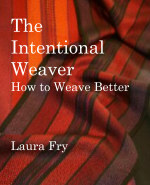 It may be a gift for someone - if she likes it - otherwise there should be enough for a shawl. The light bits are angora in a white/grey. I have a busy day tomorrow with errands but I'm hoping to get the next tea towel warp into the loom so that I can start weaving again on Thursday. All this...maintenance...is a bit of a pain, but I am going to be very happy to finally get my mouth fixed. Glad your surgery went well! And the yarn is a gorgeous colour. I love warm reds.